My great grandparents, Elvira and Pietro Del Principe, had 17 children. The youngest was Francesco Nova. Francesco had two children, Muriel and Frank Jr (Luke). 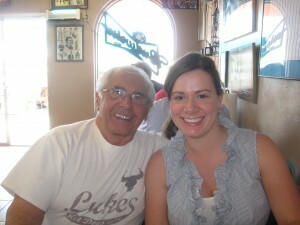 The photo on the left was taken two years ago when my daughter Ashley visited Luke in Tucson, Arizona. Luke owns several restaurants featuring Chicago style beef sandwiches based on his mother Edith and his cousin Margie’s original recipe. Next month Luke will celebrate his 80th birthday. He still works at his restaurant each day, maybe that’s his secret for looking so young. The Tucson news highlighted Luke’s restaurant in their morning show called The Morning Blend. Click on this link to watch Luke’s son Jason show us some mouth watering samples of Luke’s famous sandwiches. For more blog posts about Francesco’s family click on his name in the categories box in the right column of this website.